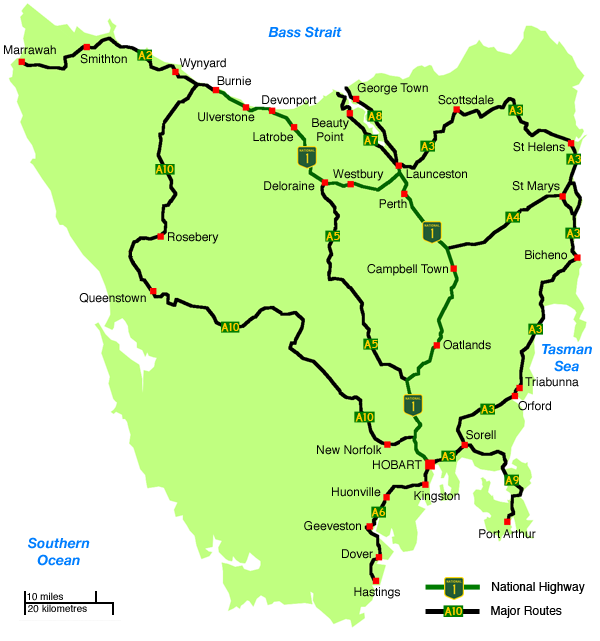 Map of Tasmania showing the National Highway route and other major roads. Source: Paul Rands, December 2006. Tasmania is the oft-forgotten island state of Australia, located to the south of the mainland across Bass Strait. The Department of Energy, Infrastructure and Resources (DIER) owns and manages the more important roads in the state. Because of its isolation, Tasmania's roads are not well documented and this site hopes to do something to change that. Follow the appropriate links to discover all about Tasmania's roads. Under the 'Expressways' section you can read all about transportation plans for Hobart and Launceston, their grade-separated (i.e. expressway-grade) roads, and expressway-standard rural highways. Under the 'Highways' section you will find pages on each of Tasmania's highways, and former highways. All other routes can be accessed via the appropriate route number in the 'Route Numbering' section.